Chicago Cubs fans are getting a chance to take home a piece of the team's historic season. CHICAGO (WLS) -- Chicago Cubs fans are getting a chance to take home a piece of the team's historic season. 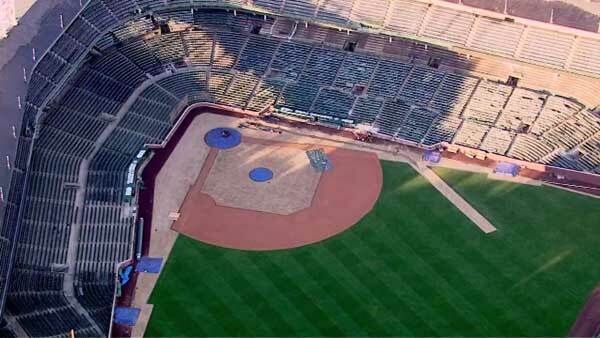 Each offseason, the team replaces much of the grass at Wrigley Field. On Monday and Tuesday, the Cubs are giving away 18 in. by 18 in. pieces of sod on a first-come, first-serve basis. Officials said fans should head to the "knothole gate" on North Sheffield Avenue just north of West Addison Street to claim their piece of history. They also recommend checking with a lawn-care professional to see if the sand-based sod will adapt well to the soil outside fans' homes before picking up their square. Cubs officials also thanked neighbors for their continued patience as renovations continue. Construction continues outside the marquee at Wrigley Field.